I looked down at my foot— snugly cornered between the neoprene velcro-strap and the board. Oddly, time slowed as I watched myself hit the water; a movement that violently snapped my ankle in an unnatural 90 degree angle. Later, the urgent care nurses, doctors, and x-ray techs would ask if I heard the bone snap. I couldn’t tell them. 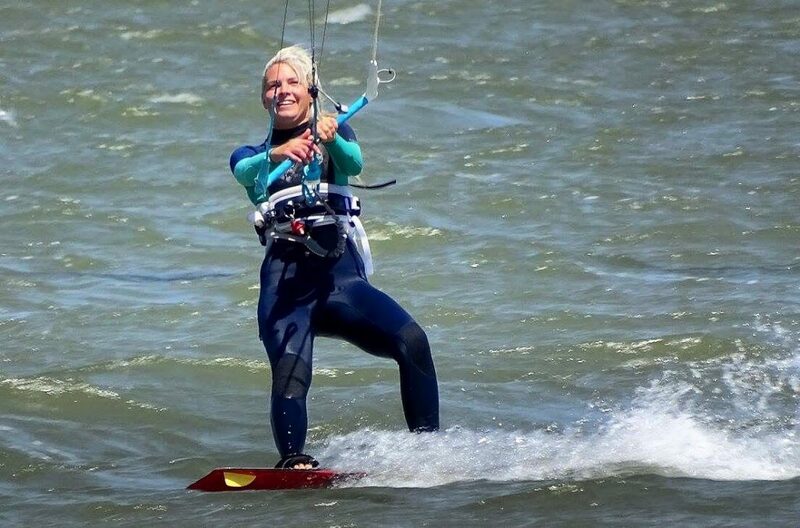 I don’t know what I heard, but what I felt was the kind of feeling that takes you off of your feet, away from the office, and puts kiteboarding on hold for many months. I knew this moment was one to change everything. The impact threw me forcefully into the shark infested and crisp ocean waters of Southern California. When my head bobbed above the surface, I screamed for my friend Adrien; who had been kiting close by. I was trying to think of what I needed to do next, but it was all I could do to breathe. Blurred thoughts to, “Fly your kite. You have to fly your kite. You can’t let yourself sink. Thank God you have people here,” found themselves intermingled amidst the shooting pain. I remember Adrien kiting up next to me, asking if I was hurt and nodding in response. He instructed me to fly my kite and explained that there were kiters waiting on the beach to catch me. I looked towards the shore to see the silhouettes of friends waving me forward. I found out later that most of the kiters— who had witnessed my frantic screaming and odd splashing— had thought I got bit by a shark. Thankfully, I didn’t befriend any sharks. A broken ankle is traumatic enough for a Monday afternoon. Some could say I’m unlucky, and yes, breaking a bone is very unlucky and extremely inconvenient, but within this situation, I find myself grateful. Thankfully, I had people around to carry me across the beach, pack up my kite gear, and drive me to urgent care. Thankfully, my family was able to drive three hours to pick up my car and take me back to the farm. Miraculously, I don’t need surgery, have health insurance, and the injury is not to my hand (meaning I can still write). I can’t carry my own coffee while using my crutches, and I currently am a fair amount of responsibility, but there is good within the pain. There’s something gorgeous about people showing love and a tender touch— holding your hand and wiping the tears from your face— when you can’t do anything for yourself. When your humanity breaks through and there’s nothing you can do but accept kindness in your moment of extreme need; that is so irreplaceably beautiful. Although, I can’t go into much detail at this time regarding my career, I had reached my breaking point; crying every single day that I drove to and from my job. With feelings of being disrespected and discontent over being held-back at the forefront of my work life, I was desperately dreaming of an out. ‘If only I could have months and months of uninterrupted time to write on whatever I wanted. If only I could be free. If only they would let me do what I set out to do. If only they saw me for who I am instead of the work title I possess.’ I wanted so much more and I knew I didn’t want where I was, but I didn’t know how to get what I wanted. An injury is not what I wanted, but now that I have it, I have nothing better to do than make it the best thing that has happened to me since quitting The Airline. Eight to ten years ago, I struggled through (and almost lost) a battle to an illness, so I am familiar with how events in life can— on the surface— look like a setback, but ultimately result in a blessing. That illness was NOT the best thing that happened to me, but a really great life and a better woman ended up blossoming out of the rubble of who I was. Over the last few months, I have felt low— like that-time-ten-years-ago-low. I have been asking for “my big break,” and to say that a broken leg is what I hoped for is ridiculous, but maybe, I can be thankful I broke my body accidentally before my spirit was crushed indefinitely. I needed time. I need time. Now, I have to accept it. I have a lot of work ahead of me as far as recovery goes. This injury could seriously affect my chances of flying at that company anytime soon. This injury may have put me even more months behind that of successful flight attendant. I don’t know that. I can’t predict what could happen next. I didn’t plan to go to the beach on Monday and leave with my leg— and all of my plans— shattered. It’s too much to ask what I will do in three months, but I can tell you about today. Today, I will read. Today, I will write. Today, I will take some painkillers. It’s simple really. So, they— those plans I had— are shattered. All those plans I so artfully made. The flight that I was scheduled to work in May is given to someone else. The things that I had decided to do. The people who I wanted to date. None of that will be right now, but now, there is time for a whole lot of ‘other goodness’ to be. I have three months to create a life that might not include kiteboarding or my employer, but what if it could be better? What if this break made me redirect into a direction that I needed to take in this moment anyway? What if I was always meant to have this time to create? Trust me when I say, I will fly. Trust me. I will. I will get to the point where I’m flying so much, I would love for someone to tell me, “you’re grounded.” For now, I can’t, but what I can do is create art. I can write stories. I can invest in my friendships. I can exercise my body in a different way than I normally do. I can heal. I can forgive the people that I am upset with and take my destiny back into my hands. I can come back stronger than I ever was before. I can still do so much. (One of those things I can do is laugh and smile) It’s amazing what happens when you experience pain. You learn that everything is a little less scary. That you went through that thing, so maybe the other thing you have been so desperately wanting to avoid— and so incredibly terrified of— is nothing actually. You got this. You also learn that people are your lifeline and it’s ok to say, “I need you.” Because, I need you. All of you. Thanks for listening and walking with me through every setback and miraculous moment. There will always be more on the horizon.